It is estimated that in the USA between 40 and 50% of all food produced is wasted. 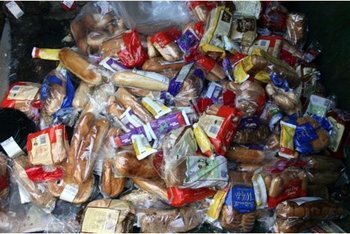 There are about 320 million people in the US, so we could safely say that this wasted food could feed at least 100 million people. The European Union fares little better. According to the European Commission about 90 million tonnes of food is wasted annually in Europe alone, with global waste at about 1.3 billion tonnes. In developing countries, over 40% of food losses happen after harvest and during processing, while in industrialized countries, over 40% occurs at retail and consumer level. According to the US Food and Agricultural Organization food waste in Europe alone could feed 200 million people, and that if global waste could be cut down by 25% it would give enough food to feed 870 million hungry people. Obviously the so-called developed nations are the worst offenders. Per capita waste by consumers is between 95-115 kg a year in Europe and North America, while consumers in sub-Saharan Africa, south and south-eastern Asia, each throw away only 6-11 kg a year. Lack of awareness, lack of shopping planning, confusion about “best before” and “use by” date labels, lack of knowledge on how to cook with leftovers (households). Fortunately the EU offers a free downloadable brochure explaining how as an individual you can cut down on waste, get it here. But most of the waste comes from industry, with millions of tonnes of food thrown into skips at the back of supermarkets every day. Systematic waste we might call it, but what can be done about it? Well let me tell you a story, I have a friend who describes himself as a freegan, he only eats free food, and he eats well. He lives in a large housing cooperative in Massachusetts, and he does the shopping for the entire group. He has his rounds, every Wednesday he goes to the orange juice processing plant and gets a few gallons of discarded juice. On Thursday a supermarket, on Friday after the farmer’s market there are boxes of discarded vegetables, if he didn’t have a trailer he would need a truck! I must warn you though that climbing into the skip outside your local supermarket might be dangerous or illegal. In Germany, England and Wales for example it is theft, although rarely prosecuted. In Italy it is legal, but in the US you may be charged with trespass. 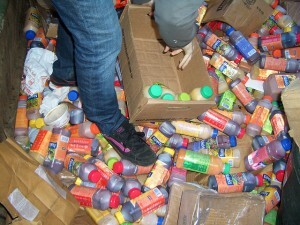 Here is a great article about what they call in the US dumpster diving, with an interesting shopping list of what was found, and the pictures in this post are taken from the event. And it is not just rotten old tomatoes here we are talking about. Many things that are close to their sell by date are thrown out. In Cambridge Mass where I live there is what I refer to when speaking to my kids as ‘the expensive coffee shop’. It is good coffee, and the cakes are fantastic, but it is a little on the pricey side. But if you go 10 minutes before closing and buy a coffee they offer you a free cake, and as they are pushing you through the door at closing time you are expected to take scones, cakes and left over bread home, for free. Better than throwing it out they say, and they are right. It does however pose a problem for the economy, with people like me giving their secret away and the place filling up 5 minutes before closing time, although you have to be shameless to go every day (get your friends involved). One thing that we have lost is the skill of home preserving foods. When we have all of these extra ripe vegetables we eat what we can, but when there are just too many they end up in the bin. Well if we learned to pickle food we could preserve it and avoid all of these problems, there are plenty of pickling lessons on YouTube, you can also freeze almost anything if you know how to do it correctly. If you are not up for climbing into a skip and you are ever in Copenhagen, why not try the restaurant that serves only waste food? See this report on the BBC, it looks good, and I am glad to see someone is doing something with all of this good valuable nutritious stuff. And the moral of this weeks story is that people are hungry because of economics, politics and logistics, not because there isn’t enough food to go round. You might like to think about that when the industrial agricultural food companies are touting GM as the answer to global hunger. It would be interesting to see the wastage levels before and after the introduction of use by dates. Given that the producers need to have a reasonable margin for error it must have been one of the biggest contributors to the wastage. Also, in the US you appear to have a dining culture where it is expected that you get more food than you can finish (hence the invention of the doggy bag) and people are dissapointed by smaller portions. This must create a lot of waste at the catering level as well as all of the doggy bags thrown away a week or so later. It is a shame that there is no way of redistributing that food to poorer nations. Yes I think that the dining culture is responsible for a lot of waste. Tables laden with food at conferences, restaurants serving giant portions. Oh and people get fat too! Before sell by dates means before supermarkets became the norm, and I think there was very little waste in those days. If you go and buy something by weight you buy what you need, and consume it all. Less stocking, less waste. I can remember supermarkets without sell by and best before. From what I have read, best before was introduced in the 90’s. I wonder if there are any controlling bodies that manage the reasonableness of best before. Manipulating your best before dates must be a great way of getting incremental increases in sales. I have recently seen a best before date on a bottle of water. Terrible to think that water can go off when in a sealed bottle. Oh but Neil the water doesn’t go off, it’s powers to make you younger and thinner deplete on that day though so it becomes worthless. I have a friend who works for a well-known UK supermarket, and he is very interested in the food waste part of the business. They have recently started to send out of date fruit and vegetables to a local animal rescue centre, which prepares the food for the animals. This reduces the cost of feed for the charity, which in tern means they are demanding less food from the market. It also reflects well on the supermarket, as they can claim they have sent so much food to this charity. I understand all food not suitable for animal consumption is composted down and the heat generated used to heat greenhouses. At the end of every day, a homeless charity used to come and pick up whatever food they wanted, however I understand that this stopped as they were (naturally) quite selective as to what they wanted to take, and the store did not want to make time for this. Christmas is the hardest time for any food store. I know that Christmas of 2012 I went in to shop for a few bits on Christmas eve (bad idea I know!) and almost every shelf was completely empty. My friend tells me that it was the reverse this Christmas just gone: way too much was ordered, and they ended up taking food straight off deliveries and chucking it in the bin. Without the manpower to deal with the quantities, food that was way within its sell-by date was not even being given a chance to sell. You would think from a financial perspective, food outlets would try to keep much tighter control on their stock levels, as surely it is better to sell out than throw stuff away? It is interesting to see how the law differs from country to country. I think it would be fantastic if all companies were forced to do something more productive with wasted food. The restaurant example was fantastic.